Scientists say that memory and the sense of smell are intimately intertwined,1 and it’s a sure bet The Legal Genealogist isn’t going to disagree one bit. That link of memory and smell was driven home again yesterday when I stopped off at the farmers’ market to see what might be available that wasn’t in the weekly share from the farm cooperative where I have a share. And there they were. 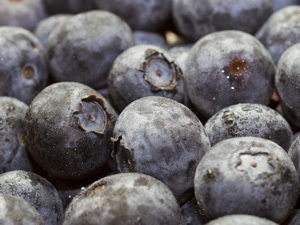 Farm fresh Jersey blueberries. Plump, juicy, sweet and oh so very delicately scented… and instantly I am once again four years old and summer has just arrived in a new town, a new state, even a new country from what I can remember. I was born in Colorado, but I have no childhood memories of that state. When I was two, my father — a chemical engineer — accepted an assignment with Shell Oil Company that took us to The Hague in The Netherlands for a year. I have nothing I’d be willing to call memories of the year in Europe, though I do have fragmentary memories of the return trip on an ocean liner. So the first recollections that I have that I’m confident are real memories are from the time after we got back to the States and moved to a big white house on a dead-end street in what was then called Stelton, New Jersey. Next door to our house was the backyard of a property that ran all the way from the next street down through to our street. And in that backyard… oh, in that backyard… were blueberries. And not just any blueberries, but blueberries grown by a magician. His name was Bailey B. Pepper and he was a scientist, a Ph.D. scientist — Dr. Pepper! — to boot, chairman of the Department of Entomology at Rutgers University.2 He had a green thumb, an impish and wicked sense of humor, and the ability to make a child — any child — think you were the center of his world. And the first memories I have of any of those three attributes are from that very first June we lived there, and the very first time he caught me wistfully eyeing the blueberries I didn’t quite have the courage to try and snitch. Now you have to understand this was back, oh, about a kazillion years ago, when dinosaurs still roamed the earth, yadda yadda, and a four-year-old just did not go up to a neighbor’s door and ask for blueberries. Standing four feet away from the bushes and practicing your cutest “pretty pretty please” look was just fine. But you didn’t beg and you didn’t take. At least not unless you were sure you wouldn’t get caught. Since I had four years of experience in getting caught by that point, I opted for practicing my cutest “pretty pretty please” look. And it worked. I was handed a handful of blueberries, the first I remember, and this tall distinguished-looking gentleman sat with me in the grass as I ate them. And that, as Humphrey Bogart’s Rick said in Casablanca, was the beginning of a beautiful friendship. The local schools were willing to take my then-six-year-old sister in second grade because she’d had first grade classes in the Netherlands. But they wouldn’t take this four-year-old in kindergarten and my parents didn’t want us more than two years apart in school. So we both went off to Rutgers Prep for a year, and Dr. Pepper drove us in and out on his commute to the university. He had me completely convinced that there was a troll under the Landing Lane Bridge that only ate four-year-olds. I can’t begin to describe my relief the day I finally turned five. Because he obviously knew so much about such matters, he was the one my sister and I went to with our fears about the monsters around our room. There was the gorilla in the closet (“gorillas are dumb, just close the door and the gorilla can’t open it to get out”) and the alligator under the bed (“it’s there to make sure you stay in bed but if you need to go to the bathroom, just tell it and it’ll let you out, no problem”) and the big one — the monster outside the house. It took us years to discover that he told my sister — who slept closest to the door — that the monster would come in the window and get me first, making her promise to run and get help. He told me that the monster would come in the door — getting my sister first — and I had to promise to run and get help. I don’t think he ever told anybody who “she” was. And I’d never been so grateful to an adult in my life. I must have been about 12 when he taught me how to make blueberry muffins. I was perhaps 13 when he gently discouraged me — after a summer enrichment class he taught in part — to pursue a career that didn’t involve math or science or (heaven forfend!) the bugs he loved so much. I was 15 when I went to him with my question about going to the prom with that boy. I was 16 when he helped me make the decision to skip my senior year of high school and go on to college. And I was only a few years older when we lost him — a loss I don’t think anyone who knew him has ever completely recovered from. Friends, they say, are the family you can choose for yourself, and in every way except biologically he was family, to me and to all of my family. Thanks, Jenny. Sure do miss him. Oh, Judy, I have tears in my eyes. Yes, I’ve had some of those friends who were “family” in my life, too. Precious memories, indeed. And where would we be without them, Kay? This one actually brought tears to my eyes. What a wonderful man. No mention of children of his own, but his understanding of how he could befriend, encourage trust, and guide other’s children was remarkable. As I read this, I was reminded of Randy DuPont. He was in high school when I was in junior high. Randy attended Jesuit down the street. There were 14 people living in that home. The second floor was literally built like a dorm for the children. Anyway, they didn’t have a fence and Randy used to sit on the back porch and I would go talk to him. He listened and looked out for me. I remember distinctly him advising me against dating one boy who was too old for me. You were very fortunate to have Dr. Pepper. He was a fixer-upper, as Dr. Pepper fans would say. Sounds like Randy was definitely cut from the same cloth. The Peppers did have two sons, much older than the kids in my family, Jimmy and Carl. I’ve lost touch with them but would absolutely love to let them know how much their Dad meant to me and to my family. Oh, Judy, you were truly blessed to have Dr. Pepper in your life! Aren’t friends like Dr Pepper wonderful? You were blessed, Judy. And so was he. I just spent a week with two three year old grandsons and a four year old granddaughter, and seeing the world through their eyes is also a blessing. I’m sure he enjoyed his time with you every bit as much as you enjoyed yours with him. What a great man. I hope he got some joy out of it, Barbara. I know I’d have had a lot less joy in my life without him. I’m glad you had Dr. Pepper to get good advice from about skipping your senior year of high school. When I wanted to take my opportunity, my parents insisted that I talk to the HS counselor who actually had the gall to say, in the mid 1970s, “If you were a boy I’d suggest that you go on to college, but since you’re a girl I recommend that you stay for your senior year at high school.” And that’s after I had pointed out that my first year at any school in that town had been my junior year of HS. I went to summer school at the college of my choice that year and discovered wild blueberries in the national forests of the Blue Ridge Mountains. Great stuff! I hope one of his relatives, pursuing their genealogical passion, googles his name and finds this post. How wonderful to have such an adult in your life growing up! I learn a lot from your legal posts, but this one touched my heart. Kathy, I would adore it if one of his children or grandchildren found this. His two sons were considerably older than the children in our household — teenagers when we were preschoolers. But I would give my right arm for a photo… tried to find one at Rutgers’ website and came up empty. So beautifully written, I was touched by your story and had to share it with my best friend. Thank you. Thanks for the kind words. Where would any of us be without the friends who’ve enriched our lives? For me it’s the smell of honeysuckle and the sound of whippoorwills and bob-white quails. It takes me back to my grandparents in Smithfield, PA. We played outside by the ‘crick’ and ran with my cousins. Grandad greeted us with an old coin and a smile the brightened his beautiful blue eyes. Memories like these bring us back to what really matters! Wonderful memories, Judy. Not only are you good at deciphering all the legal jargon you are also great at putting words together in a very descriptive way! I think the thing that surprises me most about memories that jump out at me like you describe is that the very feelings that I had come back to me so strongly that sometimes it hard to know which is the present and which is the past. Thanks for the kind words, Anne. And of yeah… scent can trigger very deep and very powerful memories that absolutely transport you in time and place. Amazing how the brain, and memory, works! Every child should have a Dr. Pepper in their life. You were truly blessed. Thank for sharing such a moving memoir. I’ll always think of your special friend whenever I have blueberries (which is often )! Thanks for the kind words. And yes, absolutely, every child should have such a friend. I love this one Judy. My Dr. Pepper was actually my adopted grandma Barnie Mae Keeling. She lived to be 102 and was a big reason for my move to Florida. She had 30 some odd grandchildren and amongst that mob that was probably one of the places that I never felt “adopted”. I fit in and would rather have been at her house than anywhere in the world. Last year 10 years after her death her remaining 3 (out of 9) children decided to split the 116 acre property. My mom is one of the 3. I never stopped going to the property. It has an old southern front porch good for sweet tea, tranquility and shelling those black eyed peas lol. If ever I were to run away from home that is where you would find me, even now. Well to make a long story short I ended up with a 25 acre patch of that sacred ground. I kid you not. My retirement plan is to start a blueberry farm. I’ve been talking about it all year and have my business plan close to complete. I’ll let you know when my first crop matures. That’s fantastic! And I will definitely be among your first customers when you get that farm up and running!